Sasakawa USA is committed to engaging with Congressional members and staff to promote a greater understanding of the U.S.-Japan and broader U.S.-Asia relationships. Toward this end, in 2014 and 2017, Sasakawa USA partnered with The Aspen Institute Congressional Program, a nongovernmental, nonpartisan educational program for members of the United States Congress, to provide Senators and Representatives the opportunity to delve into complex and critical public policy issues with internationally-recognized experts. Lawmakers attending the programs explore policy alternatives in an off-the-record setting and build relationships that are crucial to finding solutions. Through support of The Aspen Institute Congressional Program, Sasakawa USA provides an ongoing forum for candid dialogue on issues critical to the United States, Japan, and Asia as a whole. Delegates have the opportunity to deepen their political, economic, historical, and cultural knowledge of Japan through meetings with government officials, Diet members, military officers, scholars, professors, business leaders, and other experts who provide critical insights in these areas. The 2014 con­gressional delegation was one of the most senior and diverse delegations to visit Japan in decades, during a period in which the United States had prioritized a rebalance toward Asia. The 2017 delegation expanded the conversation to include Korea in addition to Japan. 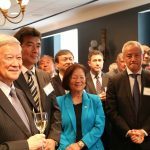 From April 8-15, 2017, Sasakawa USA partnered with The Aspen Institute Congressional Program to sponsor a bipartisan delegation of 18 Senators and Representatives who engaged with scholars, businesspeople, government representatives, economists, and other professionals in Tokyo and Seoul on America’s vital interests in Asia in the areas of trade, security, and resource management. From April 8-11, 2014, Sasakawa USA partnered with The Aspen Institute Congressional Program to sponsor a bipartisan delegation of 20 Senators and Representatives who engaged with 22 U.S. and Asian scholars in Japan on a number of issues affecting U.S.-Asia relations in the areas of security, the economy, and energy interests.